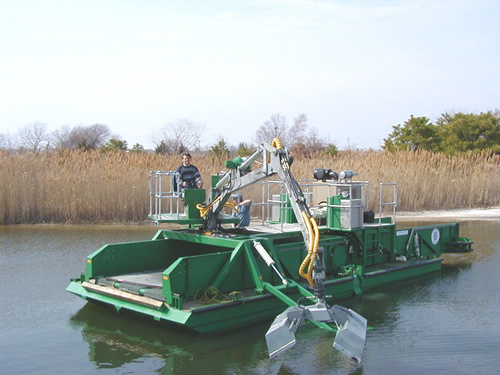 You need a well designed harvester to cut the weeds, and the trailer to get it to and from your waterway. 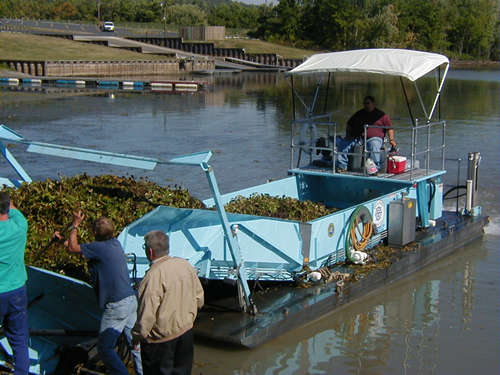 Once the weeds are harvested you need to transport them to the shoreline and remove them from your waterway. 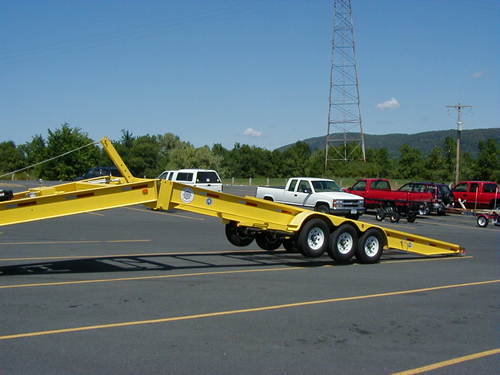 AlphaBoats Inc. makes the Weed Harvesters, Trailers, Conveyors and other support equipment you need. And , all Support Equipment is designed to work with the model of Harvester you choose. 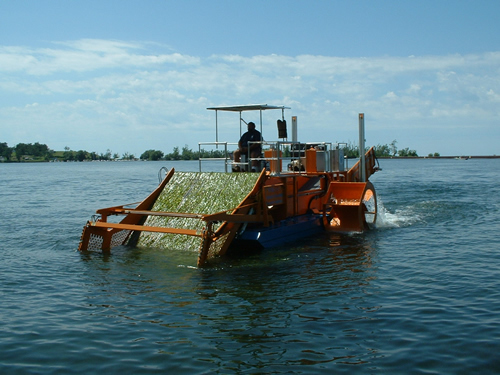 Aquatic (Water Weed) Harvesters are our flagship product line. 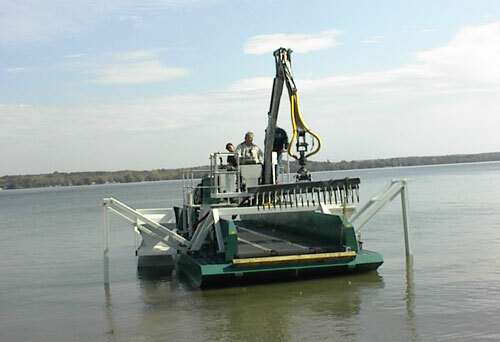 We offer small maneuverable harvesters for smaller waterways to large width harvesters for bigger lakes and waterways. Our boats are powder coated paint for fresh water and a mix of powder coating and stainless steel in areas that frequently are in contact with salt water. 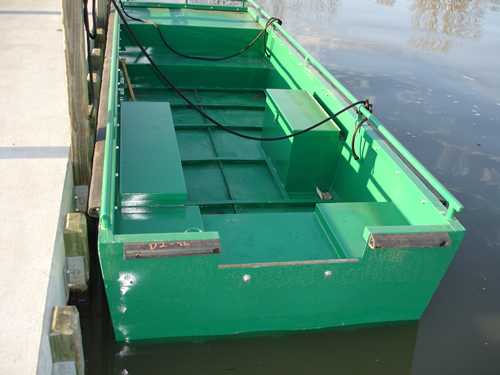 Shown here is our FX-6 model that is ideal for smaller lakes and waterways. This is our Flagship Harvester - The FX-11. The paddle wheels are tilted up with hydraulic power. The diesel engine, fuel, and hydraulic systems are mounted to the lower deck, and are protected against water splash. The elevated operator’s bridge with its controls can easily be tilted down for passages under extra low clearance bridges over land or water. It is amazing the things "Mother Nature" and people can deposit in our waterways. Logs, sticks, coffee cups, shoes, bottles and even furniture. 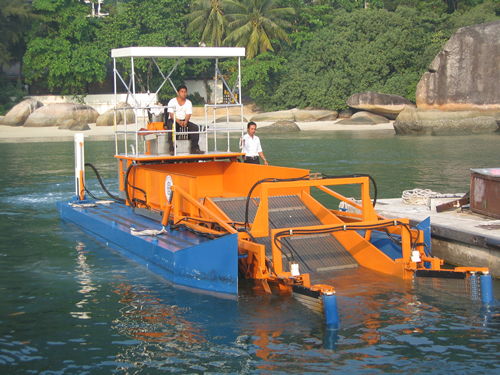 Our Marina Cleaner / Trash Skimmer is designed for removing debris from our waterways and sensitive marine areas such as beaches. Like our Aquatic (Water Weed) Harvesters, our line of Marina Cleaners/Trash Skimmers come in small and large models, fresh and salt water versions and a complete line of support equipment designed for your boat of choice. 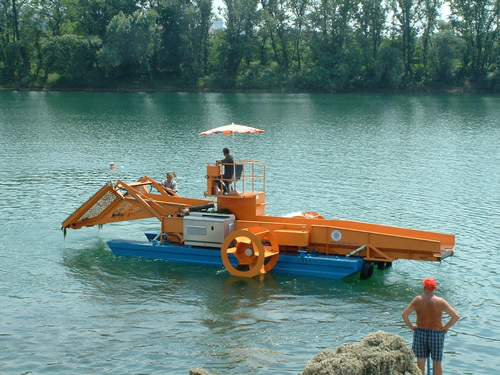 Marina Cleaners are available in fresh water or salt water versions and feature an articulating vertical wing capture system that delivers debris to the front pick-up conveyor. Large and small objects are easily retrievable and roll back is prevented with cross cleats. The design permits clear passage of large objects retrieved by the skimmer head, into the open storage conveyor. The articulating vertical wing capture system delivers debris to the front pick-up conveyor. Large and small objects are easily retrievable. Once retrieved, objects are moved by the conveyor into the open storage area where the rear conveyor system can offload the cargo. All our harvesters and cleaners have a conveyor at the rear to provide for offloading to a shore conveyor system. Aquatic weeds and debris are offloaded in a few minutes so the boat can get back to work quickly. The FX SERIES is designed for rapid deployment and frequent and effortless site to site “leap-frogging”. The paddle wheels are tilted up with hydraulic power. The diesel engine, fuel, and hydraulic systems are mounted to the lower deck, and are protected against water splash. 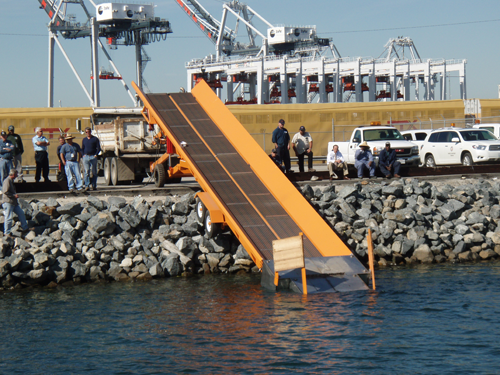 The elevated operator’s bridge with its controls can easily be tilted down for passages under extra low clearance bridges over land or water. This harvester is ideal for contract operations. AlphaBoats FX-5 is perfect for smaller waterways lakes and rivers. Smaller equates to maneuverability and ease of use in these areas. The FX-6 SERIES is designed for rapid deployment and frequent and effortless site to site “leap-frogging”. The paddle wheels are tilted up with hydraulic power. The diesel engine, fuel, and hydraulic systems are mounted to the lower deck, and are protected against water splash. The FX-7 is designed for rapid deployment and frequent and effortless site to site “leap-frogging”. The paddle wheels are tilted up with hydraulic power. The diesel engine, fuel, and hydraulic systems are mounted to the lower deck, and are protected against water splash. The SR 200 Harvester features bi-directional stern mounted paddle wheels and is "hydro-dynamically" shaped and designed for rapid deployment. 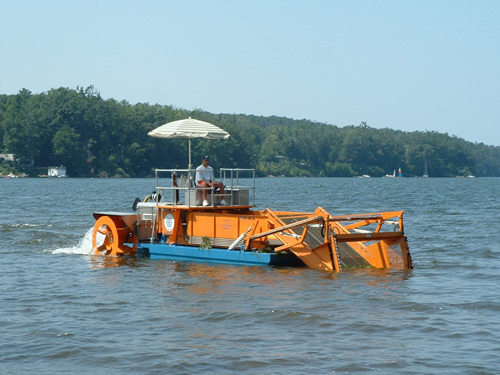 Marina Cleaners are available in fresh water or salt water versions and feature an articulating vertical wing capture system that delivers debris to the front pick-up conveyor. Large and small objects are easily retrievable and roll back is prevented with cross cleats. 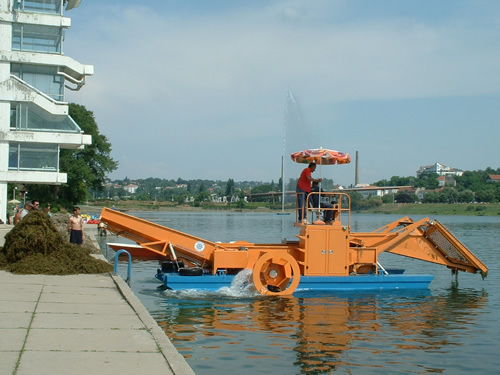 The "Hydro-Shuttle" is the ideal go -between for off loading weeds, trash and debris from harvesters or trash skimmers. The Alpha Boats Conveyors provide high speed load transfer to shore in 1-2 minutes. Heavy and medium duty Tilt-Deck Trailers for easy mobilization of all Alpha Water Management Boats. Our steel work boat is ideal for transporting crew to boats offshore. Let us help you with your aquatic weed or debris problem. Our detailed questionnaire can help us better determine our recommendations. We have designed two distinct survey forms that are easily completed on-line then sent to us. Each survey addresses details of either a water weed problem or a waterway debris issue. We also survey other aspects of your working environment to assure the equipment we recommend will be effective and easy to use. Once completed, our staff will analyze your needs and contact you with a recommendation customized for your waterway and your issue. Please enter your contact and project information in the boxes below. Asterisked (*) items are required. Ecotech Environmental & Petromarine Engineering - Promoting Economic progress with respect to environment.